Install a Drainage Channel, Starting at the Crack: When direct drainage is necessary, we can remove a section of the basement floor and run a line of PVC underneath. This PVC line would lead to your sump pump. When pitched properly, any water entering the drain will be directed to the sump pump. Carpet or wood installed on the concrete will trap this moisture underneath, resulting in mould and rot. Be sure to prepare your basement floor before installing carpet or organic materials. In the case of serious flooding through cracks, creating a lateral line to your drainage system is an easy, cost-effective way to help keep your basement dry. 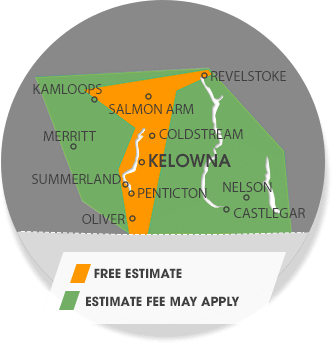 We waterproof basements in British Columbia, including the Kamloops, Kelowna, Vernon, Quesnel, Penticton, Williams Lake, Nelson, Salmon Arm, Castlegar, West Kelowna, Trail, Coldstream, Winfield, Westbank, Armstrong, Chase, Oyama and many areas nearby.